Poppies are luxurious flowers that symbolize success and love. Paintings containing poppies look spectacular in any interior setting and are always in demand. Catching sight of this beautiful summer bouquet of red poppy flowers will make you smile and lift your spirits. Its juicy red blossoms bring to mind summertime, warm days filled with sunshine and restful afternoons. The wool painting “Bouquet of poppies” would be an outstanding addition to any room in your home and is sure to draw the attention of your guests. This beautiful flower artwork would make a perfect birthday present as well as a welcome or housewarming gift. 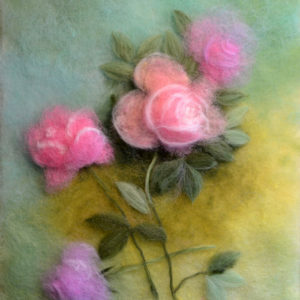 The wool painting “Bouquet of poppies” is an original artwork. Painting size: 11 x 14 inches (27.9 x 35.6 cm). Painting is nicely framed in a distressed white frame and ready to hang. Overall size: 19 ½ x 23 ½ inches (49.5 x 59.7 cm).